Yes he's hard work, but I only have him part time at the moment. 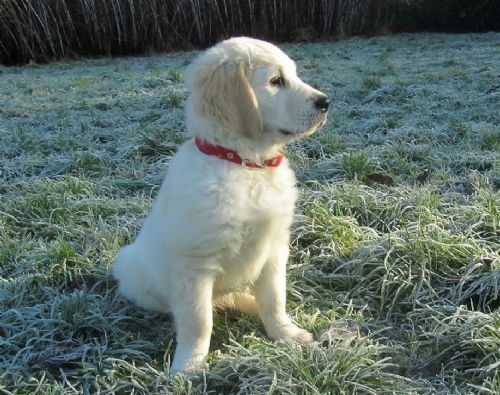 He was 8kg last week at 8 weeks, while when we met his parents, his dad was the biggest golden retriever I've ever met, so Barney here has a lot of growing to do.. I hope to make a little video of him every week, to follow him as he grows up in his first year. Here he is yesterday causing mayhem as usual, and his teeth are needle sharp... ouch..
Rusty appears to be wearing an expression of regret. Worst thing our last dog did was chew up a complete arm chair, plus the stair carpet. He's the shifty one on the left. Barney is growing up fast almost 12 weeks old now, and he already weighs 25lbs..
Their nose won't like it. The one on the right was our Badger. When he barked even the Devil did a runner. No progress on the Guzzi, been busy with other stuff, though I have been idly considering if my next project could be supercharging a Guzzi? Looks do-able I reckon.. 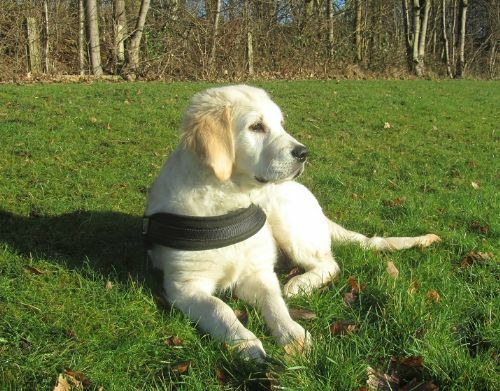 Anyway, after fearing the worst when young Barney fell very ill, after treatment he bounced back amazingly quickly, and now he's getting on for 40lbs at 15 weeks old..
Photobucket have just changed their rules so that you have to pay them before they allow third party sites to link to your own photos on PB. If not, all your photos go missing, hence all mine have vanished. At least Youtube still works, so here's the last update from back in April.. Since then progress has been glacial, due to other projects and my laziness.. 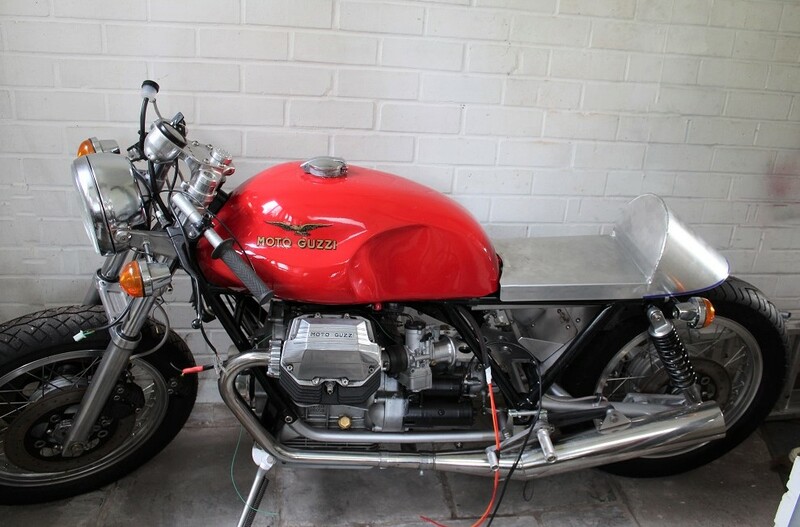 But I've got a few days clear this week, so hopefully I can find the time to work on the Guzzi again. As for young Barney, he's now 8 months old and just over 7 stone, and he's still growing.. The Guzzi is by a long margin my longest running project, I haven't touched it for nearly a year, but now finally I can work on it once more. The long break has caused me to rethink a few things, and I'm already into changing some of the work I've done in the past. 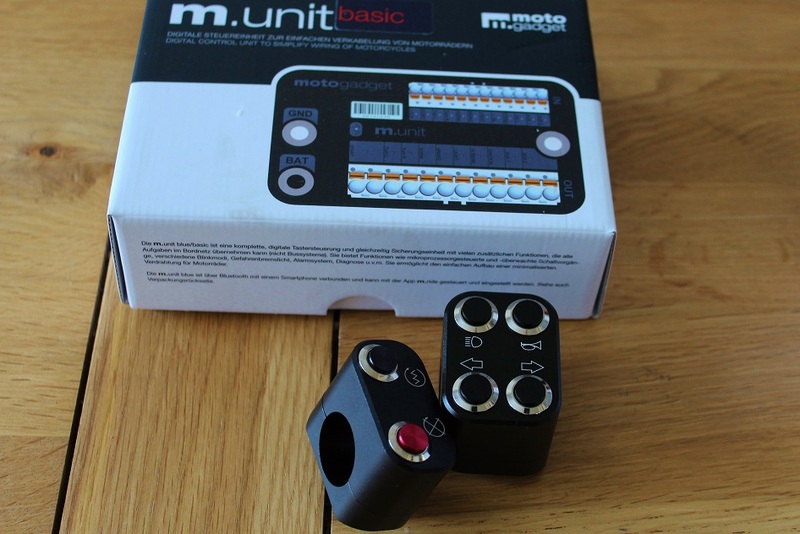 Firstly, all the electrics have been removed and instead its getting an M-Unit from MotoGadget along with matching switches. I've got the M-Unit fitted to two of my other bikes now, and since I'm impressed with it, decided to add a third to the Guzzi. The only thing I don't like about it is the price.. £245 retail, plus you need to use momentary contact handlebar switches to (if you want to use all the function it has to offer). Once that's been done, the next change will be to the seat unit.. I've reluctantly concluded that the Ducati SS900 Desmo seat its using now just doesn't look quite right.. its too long and slightly too narrow. I've not found anything out there that I like and would fit the frame rails so far, so decided to make my own.. I started by using CAD.. Cardboard Aided Design, and once I'd got something that looked about right, I drew a simple diagram and took it along to the Geoff, the local welder who made it in 2mm aluminium sheet. Though I lent a hand turning the handle of the shop rollers to add the curve to the seat hump. Great to see it coming together, the bike looks great, and Im sure will be a stunner. Now that you are on the cosmetic stuff you’ll probably find that the build will suddenly become energised and take off, family commitments allowing. I love watching fabrication vids so thanks for taking the trouble. Thats some bending machine in that workshop. I’m a big fan of Motogadget stuff, in terms of reliability, it’s been great but the one weakness (?) I’ve come across is that the wires in the switches are so fine that any movement (rotation) of the switchgear assembly can snap them at the connection point, so make sure that you give yourself enough slack for a trim and refit. If I was to make my seat again, for comfort, I’d have a shallower radius along the left and right side rather than the steep 90 degree drop above each frame rail as in use the edges can dig into your inner thighs when your feet are down. So if you yet have to upholster the seat, then can I suggest that you really pad over the corners along those two edges to effectively take the ‘sharpness’ off of the sides of the seat. This is something that you only discover after the build! Keep up the good work and keep us posted. I’ve been through the entire process and thought about and overcome several design problems with my own build, so if here is anything that you might want to chat about (2 heads are better than etc) drop me a PM. I’m sure that you have a lot going on in your head and that you already have ideas about how it will end up but if I can help with my own experiences of finding solutions just ask. Do you want your seat to be quickly detachable? if so I can run you through my solution and which parts you’d need. Are you keeping the rear indicator stalks or looking for a cheap but neat solution. How’s your wiring going to exit the bars? There’s a simple and nifty solution. What are you doing with the rear frame tails, chopped? if so how will that look with the angle of the rear seat. 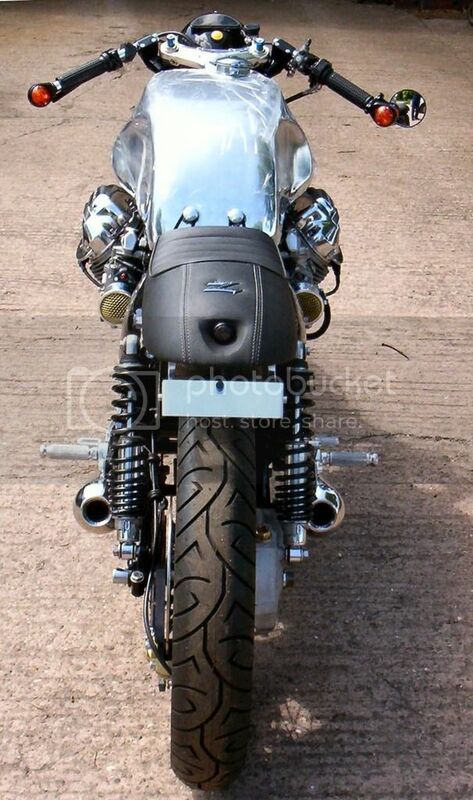 I've been busy with other project bikes, so the Guzzi went on the back burner, though part of that could have been because I wasn't happy with the seat and some of the compromises I'd made. I'm now trying to revisit those areas until I'm happy with the bike. A case in point being the electrics, which I ripped out and starting again using the clever M Unit. Though I'm not using the MotoGadget switches, as they need the bars drilling to thread the wires through the bars..hardly seems worth it to pass them through a few inches of clip on. 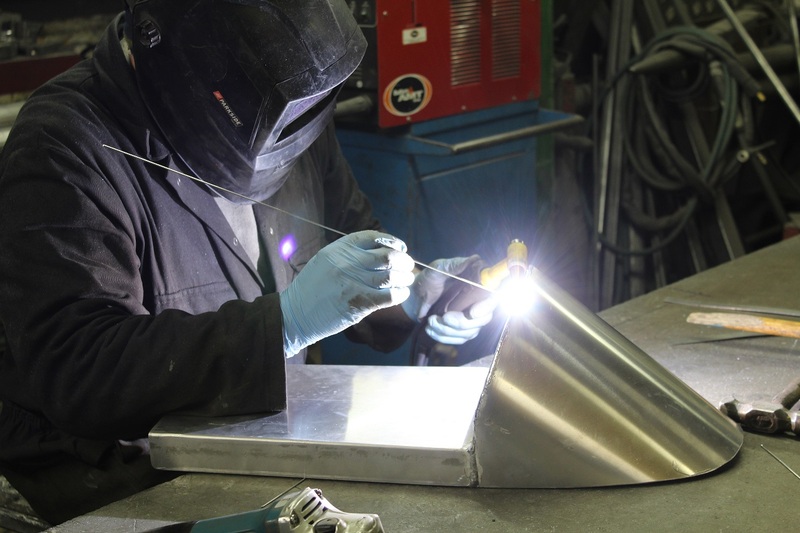 Geoff the welder always does a great job, he's so quick too, the seat took about half an hour, with me slowing thinks down by filming progress. 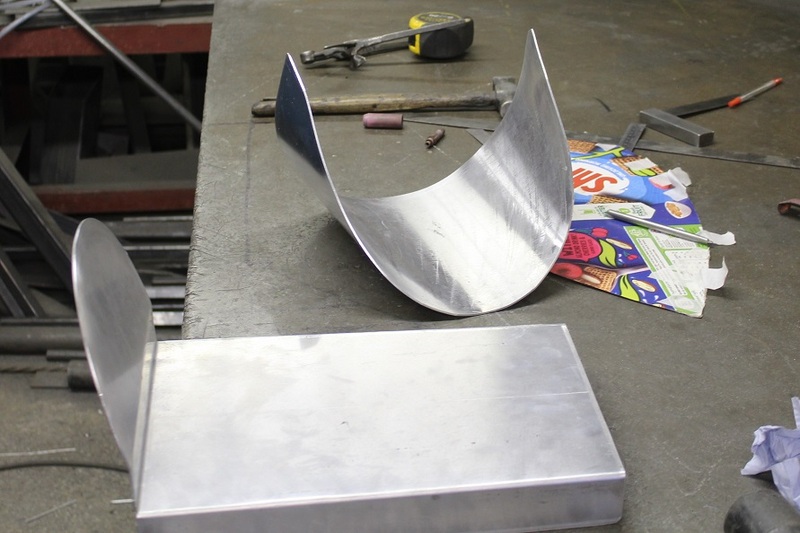 He made the stainless battery box for the Guzzi and welded my home made billet alloy swing arm last year, which turned out better than I had any right to expect... that's on YT too. The switches I'm using don't need to have the bars drilled, though you have to wire them up yourself, something I'm struggling with as the contacts are so small and close together in the housing. Also the clip-ons came with the bike, having been powder coated silver.. so I want to change them for chrome ones at some point, hence I didn't want the wiring running through them. The seat will be held down by a couple of bolts, I don't need to go to the extra work to make it a QD seat. The 70's style indicators may not stay, I may look for some a little more discrete, not sure yet. As for the seat upholstery, I'll probably have the whole thing covered in vinyl, rather than painting the alloy or polishing it. 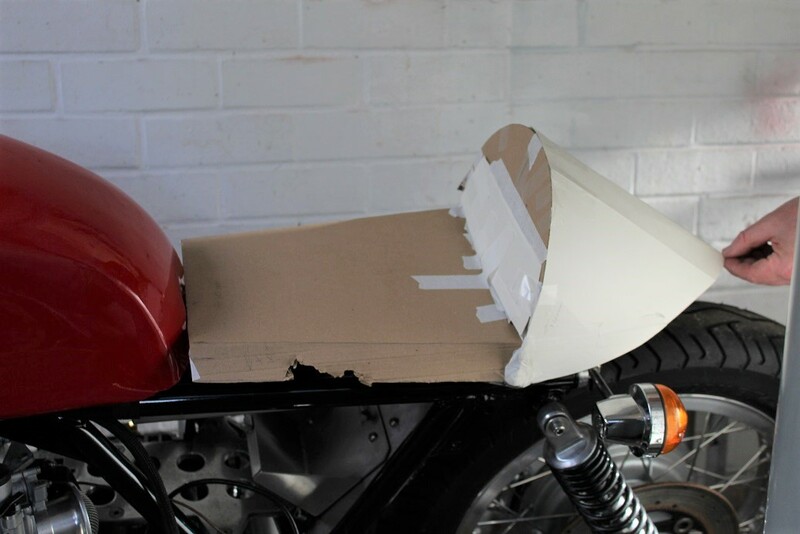 With the Guzzi seat rails being so low, it'll need plenty of foam to give me enough leg room with the rearsets. I left plenty of room between the seat rails and the seat 'skirts' to allow for the foam / vinyl to wrap around underneath.. which should (I hope) give a more rounded appearance, to match the alloy tank. Still unsure how to fit the rear light /plate, and I'll probably have to fit taller rear shocks to give enough rear tyre clearance. Bit its being built on a shoestring budget, so that may have to wait. (recommissioning my old Ducati is currently taking every spare penny). The rear of the seat rails have been cut already, and alloy bungs have been hammered into the ends.. interference fit.. they have threaded holes which is how I mount the rear indicators. Thanks for the offer of help, I may need it sooner rather than later lol..
Can’t wait to see how you progress with this build.